A week without yoga and my body just doesn’t feel right these days, I’ve learnt to really love it - the type of relaxation it gives me is like no other. Seriously, if I have done a yoga class I know I will sleep like a rock that night! Initially when I first tried out yoga I went to an advanced class and mashed up my neck (not so good)! Then I decided to try it out again; I was on holiday in Thailand and decided to tag along with my friends to do Bikram yoga. Why did I do that to myself? Thailand is already hot, why am I going to Bikram yoga?! I was traumatised to say the least. 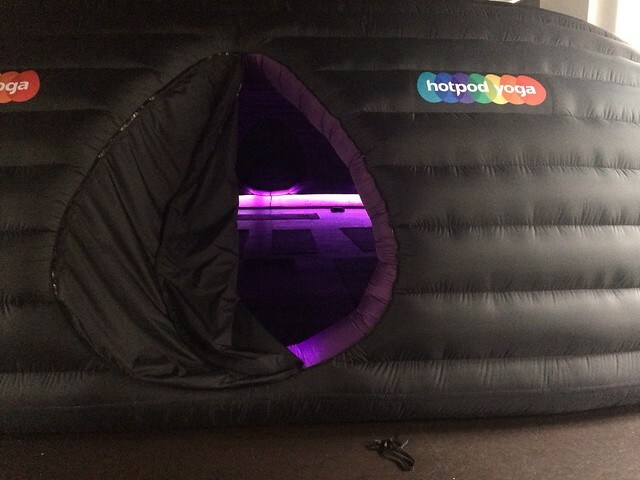 When we got invited down to try out Hotpod Yoga I was anxious. I have learnt to love yoga but I have also learnt to hate HOT yoga. But I was reassured that Hot Pod Yoga was different to Bikram yoga and wasn't as hot. So we booked ourselves in for the Hackney venue. I arrived at The Trampery on Mare Street (free parking on the weekend around the corner FYI) and walked through the buff smells of eggs, sausages, beans and toast in Look Mum No Hands! Up to the first floor where I was greeted by our yoga teacher for the day Catherine. 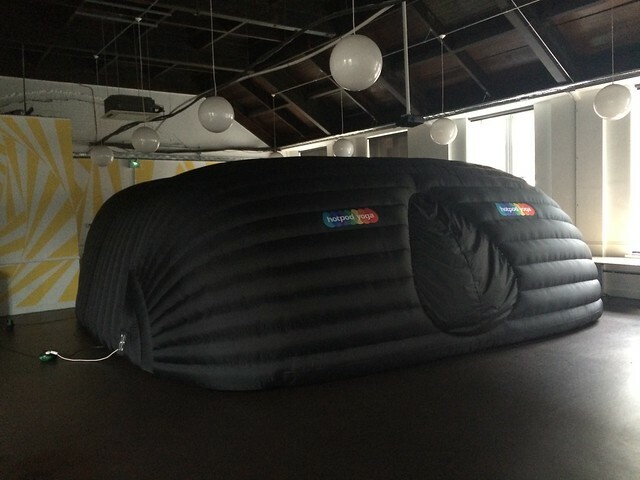 A huge inflatable pod was sat there inside the room, big enough to fit 20 people inside. After resisting the urge to jump on top of it like a bouncy castle I quickly got changed, grabbed my bottle of cold water and towel while Catherine unzipped the pod and I got inside. The pod is designed to keep heat inside. The heat inside is created with hot fans. The temperature goes up to 37 degrees celcius, which is sweaty but surprisingly not unbearable! Inside the pod was dark but wasn’t too dark that we couldn’t see what we needed to do. 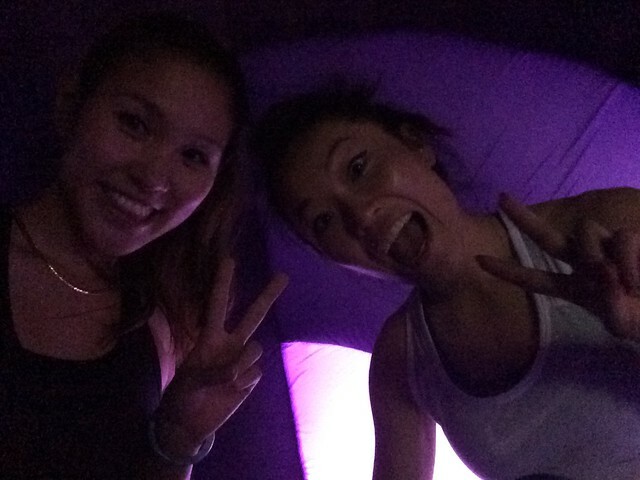 The pod was subtly lit with neon purple lights. This coupled with the chilled music Catherine had playing in the background was so relaxing. 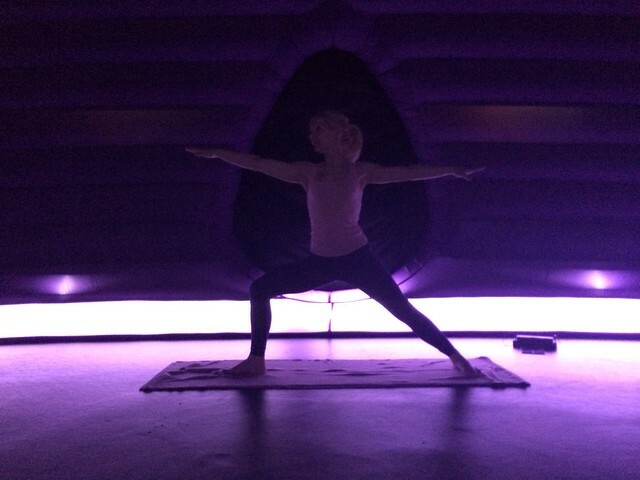 Catherine took us through Vinyasa yoga which no doubt got the beads of sweat dripping off of us! It was a challenge but Catherine made sure she took us through all the moves and came over to people who were not sure of what they should be doing. Can’t compliment Catherine enough, she was a really great yoga teacher. At the end of the class we got chatting to Catherine as she cleaned all the matts and let down the pod for another day. All yoga matts are cleaned which is good to know considering how sweaty it can get in there. 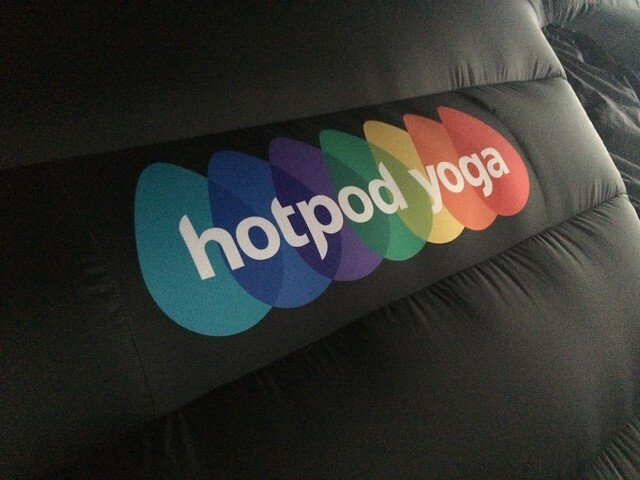 Hotpod Yoga have locations across London in Hackney, Notting Hill and Brixton. However they also have locations in South Birmingham and Swansea- keep checking their site for updates on where they’re popping up. 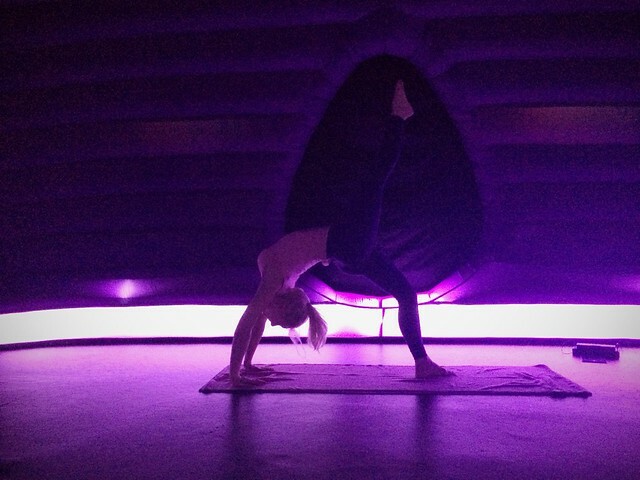 At £12 class you are getting a good quality yoga class, perfect for these chilly days.